Do you have a kitchen, laundry, or bath sink and tub that look like this? If you do, don’t despair. You can use this on any sink in your house, and it will stand up to over 15 years without scratching, peeling, fading, etc. This will be interesting to see if it cleans up well.This sink is used for everything!I first washed, scrubbed, the sink, and above is what it looked like when it was all cleaned. It may look a little yellowish, it’s coming from the light above, but it’s now a gorgeous sparkling white! I loved the way it came out so much….I painted the front and legs too! 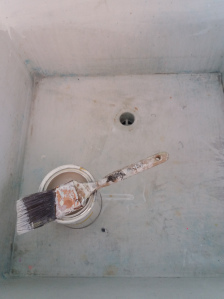 So….ready to do your sink?? Previous Bathroom Makeover On a Dime! It was so easy Michelle. You can use this on your bath tub, tile, sinks, it’s fantastic and doesn’t leave any brush strokes! For 17.00 you can refinish your bath!